It may be looking cloudy and overcast today, but apparently some more summer weather is on its way (fingers crossed!). 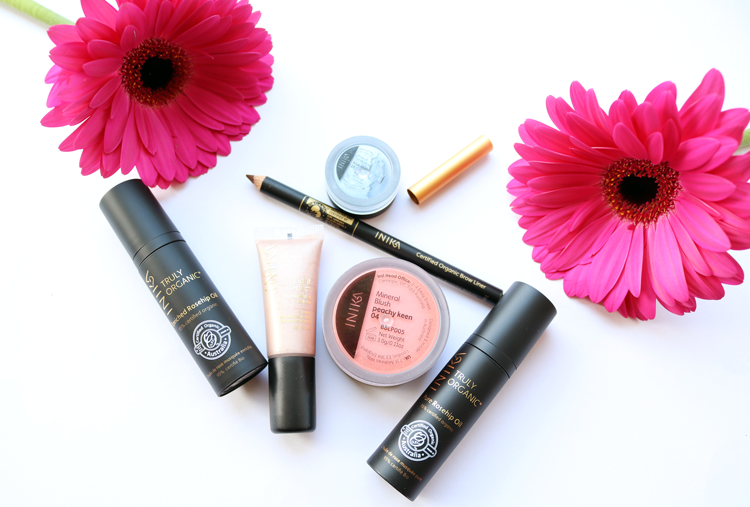 Whilst we wait for the sun to reappear, here are some makeup picks from INIKA which are all very on-trend right now, plus a review of their new Rosehip Oils. Aussie brand, INIKA, are well known on the green beauty scene for their range of high-quality cruelty-free, organic mineral makeup - I've been using their famous Mineral Foundation for such a long time now and it's still one of the best that I've tried. So it came as some surprise to me to learn that they'd recently released two new products which were not makeup based, and instead sees a potential branching out into the world of skincare with two different Rosehip Oils. Both of these are certified organic and packaged in very similar looking tubes with the classic black and gold colourway that INIKA are known for. 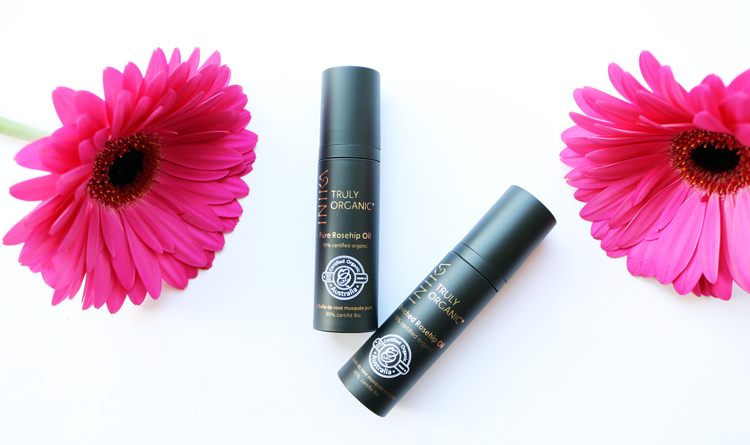 One is a Pure Rosehip Oil* (15ml, £16, link) and the other is an Enriched Rosehip Oil* (15ml, £20, link). So what's the difference? The Enriched Rosehip Oil is Rosehip Oil that has been blended with 4 Australian native botanicals, Kakadu Plum, Quandong, Riberry and Crown of Gold which are all known for their anti-aging properties. This one's been specially formulated to target the signs of aging and reduce the visibility of fine lines, as well as evening out pigmentation areas. It's more beneficial for drier skin types than my oily/combo one, but I do like using it every now and then as a night-time facial oil to give my skin a moisture boost. A cream highlighter gives you a gorgeous sheen and glow which makes you look perfectly polished in a matter of minutes. INIKA's Light Reflect Highlighting Creme is a cream formula that comes in a tube and looks very similar to Benefit's High Beam with a slightly thicker consistency and is much easier to blend IMO. Very pretty on! Big defined brows are undoubtedly the biggest trend of the moment and pencils can offer an easy, accessible way of jumping on the beauty bandwagon. I have the shade Brunette Beauty from INIKA which is shown below but sadly this colour is a little too warmed toned for me and would suit those who are looking for a solid medium brown shade much better. That said, the formula of this is really nice - firm but blendable and lasts all day. I'm a big fan of INIKA's blushers and bronzers, and this one in Peachy Keen is a warm peach shade with a subtle gold shimmer. 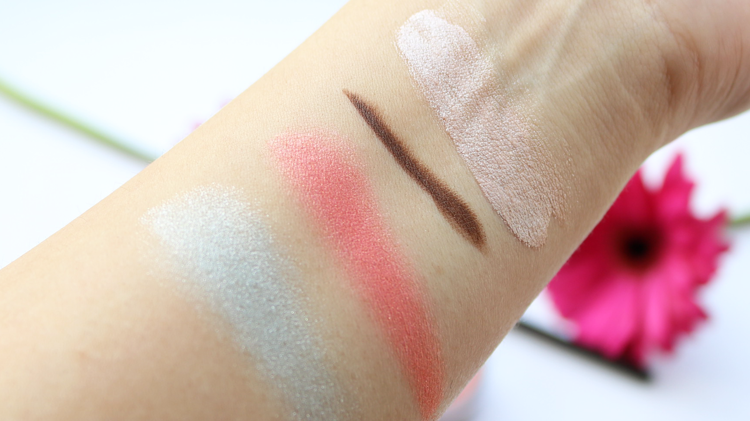 It looks very bright in the pot and when you first swatch it, but once it's blended it out, it's much more wearable and a perfect colour for summer. I find these loose powder blushes to be long-wearing, pigmented so you can choose to layer them to intensify the colour if you so wish, and they're also formulated without talc so they're ideal for anyone who has breakout issues like me or simply wants to avoid talc in their products. Blue eyeshadow has made another comeback this year on the catwalks and has been seen a lot in fashion editorials and beauty spreads. Personally, it's a trend that I struggle to pull off, but I do like to sometimes blend it with other colours if I'm feeling a bit more daring!adventurouswho are more adventorous, you can check out the shade 'Blue Topaz' which is an icy and frosty looking pale blue with lots of fine silver shimmer. Perfect for an Elsa / Frozen look! Swatches! INIKA Mineral Eyeshadow in Blue Topaz, INIKA Mineral Blush Loose Powder in Peachy Keen, INIKA Organic Brow Pencil in Brunette Beauty & INIKA Light Reflect Highlighting Creme. 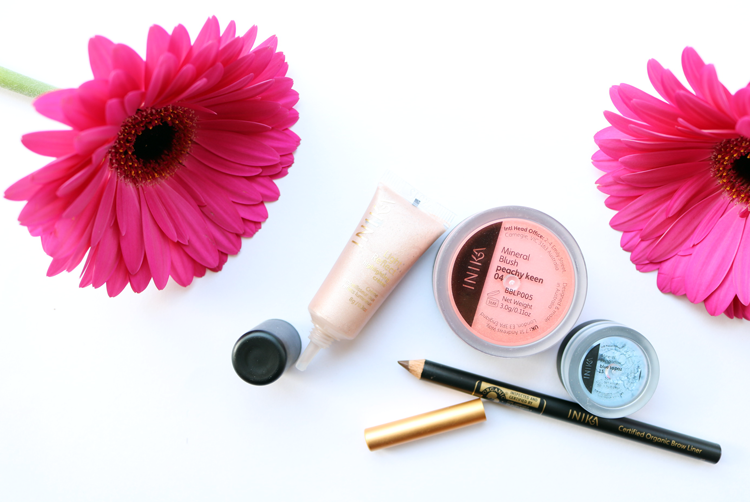 Are you a fan of INIKA makeup? Have you tried their new Rosehip Oils? Need to try that highlight creme!